Summary - This service is for digitizing broadcast tapes into new data file formats, and archiving the content for preservation and later reuse. We return the digitized content back to the customer on 2 types of Cintrex supplied storage media - a Western Digital Hard-drive and an LTO-6 tape. The LTO tape is formatted to LTFS. Price is $50 per broadcast tape, and the minimum order for this service is ten (10) tapes. Quantity discounts are available for orders of 25 tapes or more, and on 200 tapes or more. 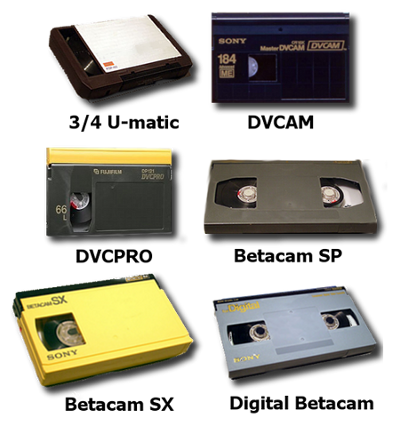 Available for the following list of broadcast tapes: 3/4 inch U-Matic (NTSC only), DVCAM, MiniDV, HDV, Betacam, Betacam SP, Betacam SX, DigiBeta, HDV, DVCPRO25, DVCPRO50, DVCPRO-HD, VHS, and 8mm Camcorder tapes. Benefits are the modernization and preservation of your business video library for the long term. Shipping: Shipping is free with this service. After order checkout and arpproval, we will provide a link for a free UPS shipping label for sending in your tapes to our lab.